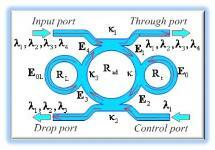 A novel system of an optical vortex generation using an add/drop multiplexer incorporating with two nanoring resonators is proposed. Such a system is known as a PANDA ring resonator structure, in which the optical vortices (gradient optical fields/wells) can be generated and used to form the photon/atom trapping tools in the same way as the optical tweezers. By controlling some suitable parameters of the input and the control optical pulses, the intense optical vortices can be generated within the PANDA ring resonator, in which the trapped photons/atoms can move dynamically within the system. The trapping force is occurred and formed by the combination between the gradient field and scattering photons, which is reviewed. A transmitter and receiver can be formed within the same system (device), which is called a transceiver. Finally, the use of the PANDA ring resonator as a hybrid transceiver for nano communication is discussed.